"Unai Emery could not have played Ozil... that's just the harsh truth." 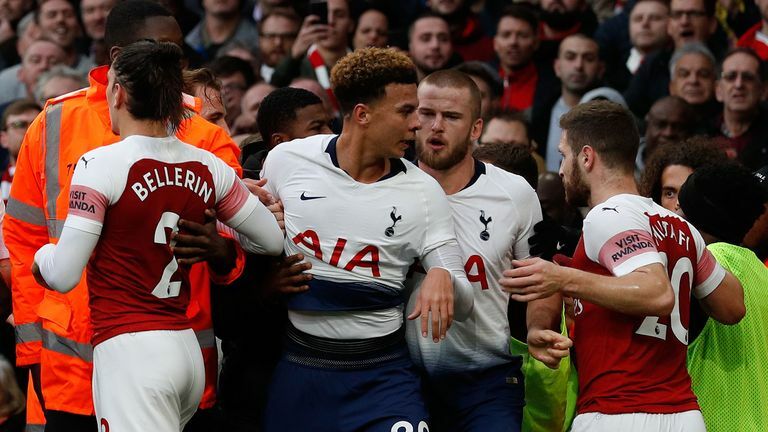 Gary Neville insists Sunday's 4-2 north London derby win over Tottenham was the day "the whole body language of the club changed". Speaking on the Gary Neville Podcast, the Sky Sports expert spoke of his admiration for the attitude of Unai Emery's players and the change in mentality that Arsene Wenger's successor has inspired. Today it was completely different and it has shocked me. It has shocked me because Tottenham are a team I really admire and have loved watching over the last two or three years. Today they have been outrun. The first 20 minutes was as good as I've seen here for a long time in terms of getting the crowd behind them. The quality, the tackling, the pressing… everything you want to see in a derby. I loved the match from start to finish. I'm not a fan of either team, but it had everything; penalties, a scuffle; tackles; good goals and it was really, really good. I'm sure Tottenham fans haven't enjoyed it, but Arsenal deserve all the plaudits that they get. Emery has obviously brought a new energy. The big problem over the last couple of years was that things had spread onto the terraces. When you came here, you weren't looking forward to it. You felt like everyone was bored. I loved Arsene Wenger and defended him to the very end because of the job that he did and I hated seeing him criticised and pilloried in the way that he was. Once the change was made, it felt like a breath of fresh air. Emery is a fantastic coach and I think he is achieving the maximum from this group of players because I don't fancy quite a few of them, to be honest. I thought this game and the trip to Old Trafford on Wednesday would work them out and he'd find out more about his players. I was wrong. They have stepped up. This was a massive step-up today because they were playing against a fantastic team and the approach from minute one was fantastic. They were on the front foot and he won't accept the nonsense we've seen over the last couple of years. Some players here haven't fancied the battle. Wenger, as the manager, took the criticism for it and that's the nature of the beast but the players have looked lethargic, disinterested and demotivated. When I come here in the future I'm judging it against what I've seen today. That is a different level from Arsenal. What we've seen today is a collective and it looks like the fans are back with the team, it looks like the players are with the manager and it looks like the manager is with the club. Mesut Ozil couldn't have played in that game. That's said with great respect, as he can play in World Cup finals and win them, but Emery could not have played Ozil with the way he wanted to win that game. That's just the harsh truth. Ozil is world class on the ball with the way he receives the ball, his weight of pass and his choice of pass in the final third but what Emery wants to establish at this club is a cultural change and a mentality shift. Ozil doesn't fit the bill for that shift, unfortunately. That's being harsh. Emery wants to play from the back with high energy and pace, sprinting all over the pitch. Ozil couldn't press today like those Arsenal players pressed. It's not his game and isn't what he does. It's not right that I speak about him too much, but that is the cultural shift and the mentality shift. The whole body language of a club has changed today. That was a big, big moment. What those players have done out there - and what Emery has achieved - is to set themselves a standard. When I come here in the future I'm judging it against what I've seen today. That is a different level from Arsenal in terms of their application and their ability to make it look like every single second of the game meant something to them. That's all you can ever expect in a football game from a football player. The ability is obviously out there, that's the reason they are wearing the Arsenal shirt. Lucas Torreira in midfield sets the tone. He doesn't leave them anywhere else to go. When you see him busying around like a terrier, the rest have to respond to it and thrive off it. It just felt like they had some nastiness about them today. Even when Eric Dier scored they went over and had a scrap with them over that. I like that. Arsenal teams haven't had a fight in them for years! That's what you expected from Arsenal in the past. It's a great football club, but it was a shock for me today to see an Arsenal team play in such a competitive and combative style. There were great moments of quality in the game as well. It was emotional at times and Arsenal will need to get better for where the club wants to get to. They need to improve the playing staff, but I keep mentioning the worlds "cultural shift". With the mentality they have shown today, a football club has got a chance. You need everybody facing in the same direction with everybody wanting to fight for every single ball. The ones who have been here for a couple of years will either step up or get off the ship and Emery has shown already that he is willing to make big and tough decisions and not carry any passengers. Today will give him some control and authority. He had it anyway, but he needed a big win and he can walk into his interview afterwards and talk to his players and say 'that is the level I expect'. Everyone listening in the dressing room should know he isn't going to accept any less than that for the rest of the time he's at the football club. There's a real scrap on now. 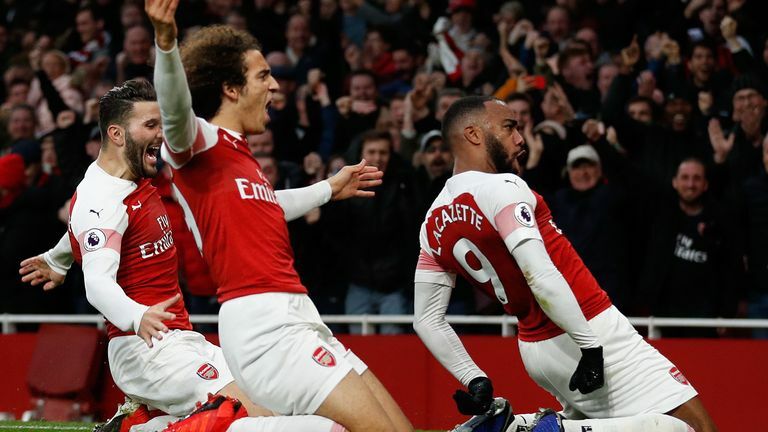 I thought Arsenal would really struggle to get into the top four, even this morning I thought the next four days would catch them out and would show their limits. This puts them right in the mix because the of confidence and belief they will get out of this game. Manchester City and Liverpool are the outstanding two teams and I think they will finish in the top four, but Chelsea and Tottenham will be looking over their shoulder.